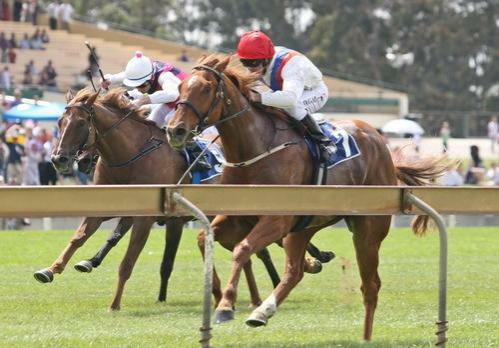 The Bairnsdale Racing Club will honour one of its finest local thoroughbreds as part of Sunday’s Patties Foods Bairnsdale Cup meeting. Outstanding sprinter Tesbury Jack, was a high-speed galloper, who raced against the top echelon in all the great Australian sprint races. The “Tesbury Jack Sprint”, a BM78 over the 1200 metres, will be run for the first time, and the club will celebrate the renaming of their public bar. The “Tesbury Jack Bar” is sure to be a popular place on race day. Tesbury Jack retired in 2010 (as an eight-year-old), with an impressive race record of 23 starts, 7 wins, 1 second and 2 thirds, contesting 16 races at Group or Listed level and prizemoney in access of $535,350. Undoubtedly his best run when beaten by the shortest possible margin by Let Go Thommo in the 2007 Group One Goodwood Handicap at Morphettville Racecourse. Tesbury Jack was successful at Listed level on 3 occasions, and once at Group Two Level, winning the 2007 Thai Airways Sprint at Caulfield Racecourse. Trained by then local trainer Julie Scott (now at Ballarat), Tesbury Jack’s racing career commenced with an unlucky third at his first start in a maiden at the Bairnsdale Racecourse in January 2006, when ridden by Rowan Waymouth. Darren Gauci went on to ride Tesbury Jack in all his remaining starts. Current Bairnsdale Racing Club Manager Brenda McPhan was Tesbury Jack’s track and trial rider. Tesbury Jack was bred and raced by local real estate agent John Riches. Riches has spent a lifetime involved in the racing industry and was a committee member of the Bairnsdale Racing Club for more than twenty-five years and is a life member. Tesbury Jack was the first horse bred by Riches, who had previously had shares in many horses, mainly with Chris Parry, who trained at Bairnsdale prior to relocating to Cranbourne. These included group performers Northern Copy and Pride Of Kellina, but a Clear Choice mare named Clear Money, who had won at Moonee Valley Racing Club at her second start, had been a favourite. Riches raced Clear Money in partnership with friends and when her form deteriorated, it was decided to sell her. Riches would have loved to have kept her but as she would not have fitted into the backyard of his then home, she was sent on her way in the mid-1990s and Riches didn't expect to see her again. Julie Scott saw Clear Money advertised in a mixed sale in Sydney in 2002. A phone call to Riches saw the owner reunited with his favourite horse, after securing her with a phone bid for $2000. Riches and his wife Merril had bought 2.8 hectares on what had been Desmond Park Stud at Bairnsdale and built a home. Desmond Park Stud was where Moonee Valley Legends Cox Plate winner Family of Man spend some of his earlier life and was broken in, prior to joining legendary trainer George Hanlon. Family of Man was the first Australian horse to earn $500,000 in stakes. Merril Riches doesn't have quite the same affection for things equine as her husband, so Riches had some fast talking to do before his new purchase arrived at their new property. By chance when putting up his old horse photos in the new study the next day, Riches mentioned that Clear Money was his favourite and he would love to get his hands on one of her foals. The mare was in foal to Rory’s Jester stallion Armidale, a dual group three winner, who ran sixth in the 1996 Golden Slipper behind Merlene. A short time later Clear Money would give birth to a chestnut colt, who would become Tesbury Jack. Riches admits that when Jack arrived, he didn't know much about rearing horses, but with the assistance of Scott he managed to do a good job. Riches had always wanted to name a horse after his father Jack, and Tesbury, the small community near Camperdown where he grew up. Tesbury boasted little more than a school, a hall and a tennis court, while the family property adjoined a very famous thoroughbred racing property; Sir Chester Manifold's property, Talindert. Previously, Riches had always raced his horses in partnership but this time decided it would be just he and his wife. "It's been a battle but I had this dream in my head that as I'd bought her back, she would be good to me," Riches said. The rest is history! Tesbury Jack was retired to a life of relaxation in 2010 at John and Merrill’s property in Bairnsdale, where he still resides.